The Evil Giraffe (Camelopardalis malum) is a regular giraffe gone wild. These even-toed ungulates were born evil due to a massive coma. Scientists found out that it was all because they landed on their head upon birth. Growing up, these animals became worse and worse. They spat at tourists, chased elephants, and pooped all over watering holes. Once mature, they sought other gone-wrong giraffes to mate with. This selective breeding made new generations of Evil Giraffes. Then, the cycle repeated itself. 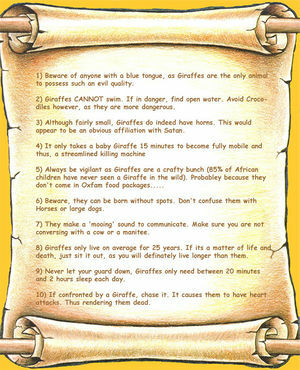 Every generation of Evil Giraffes became more diabolic than the previous one. 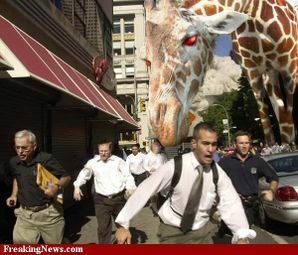 Eventually, the Evil Giraffes were banned from the herd and forced to live somewhere else. They migrated to the woods and evolved to change their skin color and height. They now have greener skin tones and measure about 10 feet tall. This way, they blend in with the trees and can still eat tree leaves. Heroes must be careful when traveling through forests, as the EG's have hatred toward anything that doesn't look like them. This ancient scroll was created by an expert who had devoted his life to studying these creatures. Please note that this information is a little outdated. Now they don't care if you chase them, now they will run at you and try to attack. Note: It is rumoured that some evil giraffes can transform into either a camel or a leopard.